You like those 48′s? 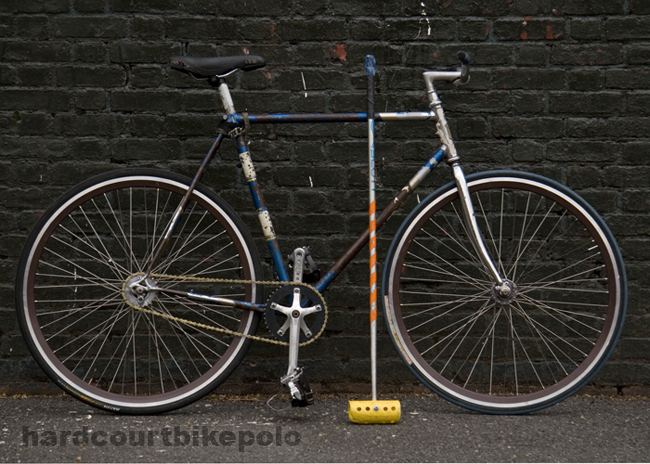 One of three wheel sets given by Steelwool Bicycles, at the 2007 North Side Polo Invite to the winners. I hope Paul will tell us more about this bike I know he likes so much. 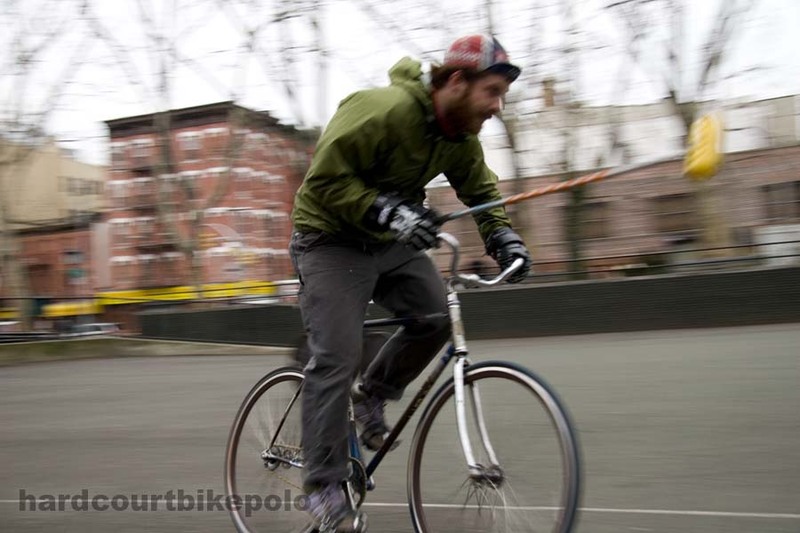 This entry was posted by Doug D on May 14, 2008 at 12:01 am, and is filled under Bikes of Polo. Follow any responses to this post through RSS 2.0. You can leave a response or trackback from your own site. this was 2002, things were different back then. we weren’t so jaded, Brooklyn was our oyster. I took that to heart, and rode this thing everywhere. I retired it the first time after i bent the fork in Chombo’s first DUMBO Alleycat, after coming in 2nd place to Austin. I brought it to the Pit when i started playing polo 2 years ago, and it’s always been my steed. Honestly, it’s my first love and it’s really REALLY hard to hang it up, but it’s stumbling to the finish line and deserves a rest. that fork on their now is a CHVNK shack scavenge, and bent as well. Right seatstay, totally crooked. I think Zach is tired of repairing/watching it fail, so lay it to rest i will. although it’s what they might call a “classic lightweight”, this frame is so so strong. I weigh about 195lbs and every part i’ve attached to it (besides the Campy headset, their when i got it) has failed. Broken pedals, straps, stems, bars, cranks, wheel set(s), seats, seat posts, grips, bottom bracket, chain, chainring, chainring bolts, fork, seat stay (banged back into “place”).. it’s a pretty amazing frame. Revered in NY in the 60s, i’m told. Now you know what to get me for Christmas! . . 56, 55 whatever. Nooooo! Frejus please don’t go. A favorite moment was seeing you play with mismatched cranks after breaking one earlier in the day. And by mismatched, I mean one was 165 and the other was 170. 195 pounds huh? i think your legs must weigh about 80 pounds each. Doug this is an awesome series. Paul, i know how it feels. It’s so hard to turn you back on love. better look at bars <— click that. i have a frame that has tried to retire for quite some time now, the thing is paul, they only have to go if you let them. I thought mine was done first when i was playing a game and i noticed a weird sort of suspension thing going on. after a few games i realized that my top tube was completely separated. done you say? well i took it to a frame builder and he traded me a great loaf of bread for a sleeve and a braize job. Years passed, the rear triangle had to be bent back with some 2 by 4 ‘s. 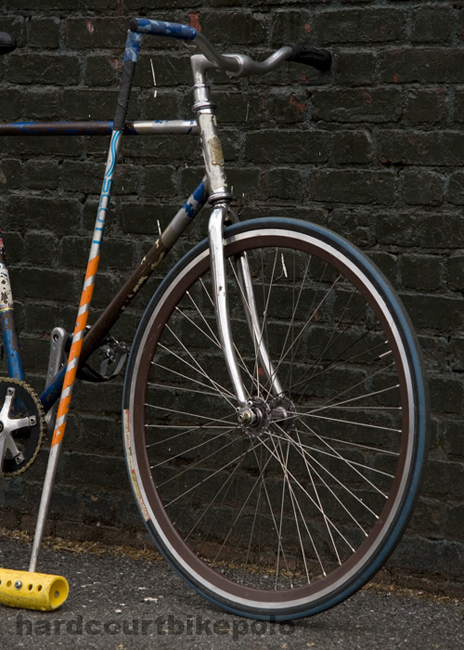 Then i was playing in a tournement in chicago and my front wheel came off and i landed on my fork splaying it out 12″. Mid game i bent it back to shape and went on to win the tourny. My forearms wernt enough to make it long term so i took it in to the frame builder again and for a 1/8th he straigthened the fork on one of those wierd fork fixin tools. Then the weekend before the winter classic i snapped my seat stay. There was taugnting over how i would have to retire her, and find a new bike. Jonny and others teased me saying i played more polo off that frame than on, but i knew in my heart that every great play, and i am a player defined by the great plays… its what makes my game work, decent play most of the time, then a goal that clears the bleachers, so i used a hose fastner and an old shifter cable, good as new. She made it all the way through the winter classic and into the milwakee invitationals. then it happend, cranking hard for ball, on my right downstroke i felt myself float… her soul was flying off leaving the frame forever. 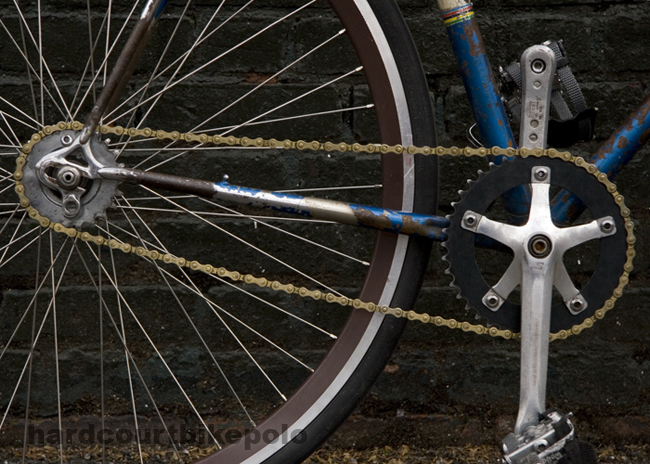 I had split the chain stay where it met the BB and the seat stay also ripped midway up… I took her home striped her parts and put them on a frame of the same year same make same model, but it didnt feel right. I was drinking with the frame builder, or here on we should call him the frame saver, or as i do the savior said to me ” i can fix it “. the four greatest words of my life, so there she is in the shop with her backend removed waiting to ride again. so there is one thing you need to ask yourself, is she really done or have you just fallen in love with someone else… from experiance, old loves never die. i may make it a project (fixing it) but right now i need something that won’t fail all the time. the new bike is a nishiki that Doug scouted from the street. don’t worry, it’s as equally destroyed as the Frejus. i brazed some single speed mtn dropouts on to the back and am just sanding off the excess brass at this point. we’ll see how it does. haha. old love neva dies. Don’t show these to Ben. He’s dehydrated as it is.